For this special volume of Paideuma, we go back to our roots with an eighty-fifth birthday celebration of Mary de Rachewiltz, an important member of the scholarly community that gave rise to this journal and made its continued publication possible. De Rachewiltz’s contributions to the field are substantial. In addition to her magisterial translation of the Cantos (I Canti [Mondadori, 1985]), she is the author of a beautiful memoir, Ezra Pound, Father and Teacher: Discretions (New Directions, 2005). After having long labored at Yale’s Beinecke Library, where she lent her special familiarity with her father’s work to the organization and cataloguing of its Ezra Pound Archive, she has made a permanent home for Pound scholarship at Brunnenburg Castle in the Italian South Tyrol. We are pleased to honor her here with a portfolio of documentary material edited and introduced by Richard Sieburth. Mary de Rachewiltz’s long relationship with the NPF began in 1985 at the Ezra Pound Centennial Conference, where she sat on a panel with Hugh Kenner to give a talk entitled “Remembering Pound the Poet.” She was also part of a roundtable at the end of the conference that included Robert Creeley, Donald Davie, Allen Ginsberg, Hugh Kenner, James Laughlin, Marjorie Perloff, M.L. Rosenthal, Olga Rudge, and Walter Sutton. At the William Butler Yeats-Ezra Pound Celebration Conference in 1990, she gave a keynote address, “A Pilgrim to Erin Shrines,” and was part of a discussion group that included Kenner, Sutton, Peter Dale Scott, and Carroll Terrell. Her first contribution to an NPF publication appeared in H.D. : Woman and Poet (1986). She subsequently contributed to three special issues of Paideuma, festschrifts for Mary Barnard (1994), Carroll Terrell (1997), and James Laughlin (2002). In her 1994 tribute to Mary Barnard, de Rachewiltz described Barnard’s Assault on Mount Helicon as “the most dignified, informative and sincere literary memoir I have ever read.” This is a statement Evelyn Haller might apply to de Rachewiltz’s own Discretions. Haller’s “Shadows on the Rock: A Book in American English Ezra Pound Gave His Daughter” is the first of four scholarly essays that follow the portfolio edited by Sieburth. A shorter version of Haller’s essay was printed in the proceedings for the 17th International Ezra Pound Conference. We are happy to include the full text here, in conjunction with Sieburth’s portfolio. The other three essays are also appropriate to this context. Sean Pryor’s “‘How Will You Know?’: Paradise, Painting, and the Writing of Ezra Pound’s Canto 3” looks at Pound directly in a reading of Canto 3 as an early attempt to “write paradise.” Jeffrey Westover and Joshua Clover look at two Poundian themes: economics and history. Westover (who, like Pryor, is appearing in Paideuma for the second time) brings fresh insight to Lorine Niedecker’s work by reading it in the context of local history. “‘My Sense of Property’s / Adrift’: Attitudes toward Land, Property, and Nation in Lorine Niedecker” juxtaposes colonial and native attitudes about ownership. Clover’s “‘A Form Adequate to History’: Toward a Renewed Marxist Poetics” closes the issue with a programmatic statement on poetry’s significance for theory. His perspective is global, with examples (Apollinaire, Frank O’Hara, Rolf Dieter Brinkmann) drawn from three stages of capitalist development. Paideuma 38, slated for publication in 2011, includes articles by Ondrea Ackerman, Russell Brickey, Natalie Gerber, Matthew Hofer, Charles Kraszewski, and Catherine Paul, as well as an interview with Basil Bunting conducted by James Laughlin and Lawrence Pitkethly, prefaced by Richard Swigg. There is also a preface by Richard Sieburth to the portfolio he edited. We will give some excerpts from that in the coming days. To get the word out about this volume we are pleased to be able to offer it at a special discount. Paideuma subscriptions for individuals are $30 a year domestic and $40 outside the U.S. Through March readers of this blog can purchase Paideuma 37 (and our previous volume, 36 [link]) at the low price of $20 (or $30 for orders outside the U.S). To order, please call Gail Sapiel at 207-581-3813 or send her an email at gail [dot] sapiel [at] umit [dot] maine [dot] edu. Tell her that you read about the new issue on the blog to receive this promotional discount. 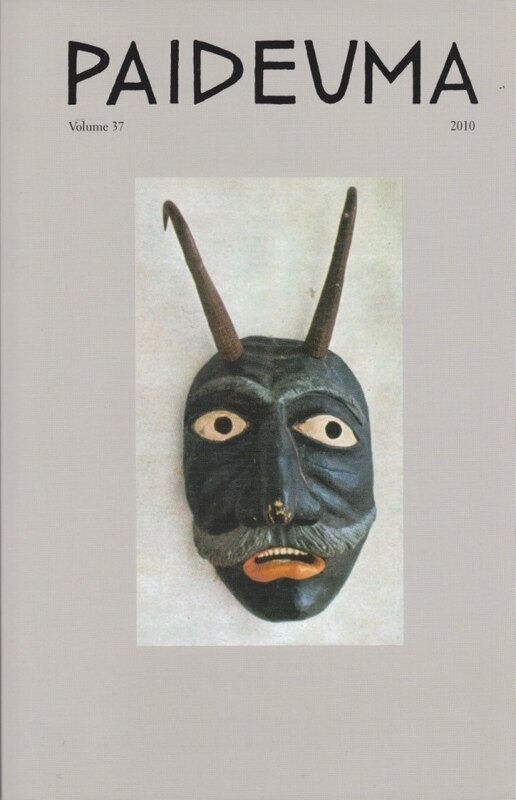 Tyrolean mask from the cover of Tiroler Masken by Mary de Rachewiltz (Milan: All’Insegna del Pesce d’Oro, 1960). Ezra Pound: “where the masks come from, in the Tirol, / in the winter season / searching every house to drive out the demons” (Canto 74). The National Poetry Foundation blog has been quiet for a few months, as we have been working overtime in the preparation of two volumes of Paideuma. If both volumes appear this year, as we fully expect (and by “year” we mean the academic year, Fall 2010-Spring 2011), the journal will truly be caught up, on schedule, and ready to move forward at a brisk pace. This is the culmination of a lot of planning and a lot of work over the last four years, about which we will have more to say in the near future. For now, we wanted to announce the appearance of the first of those two volumes, Paideuma 37 (2010), a handsome collection of documents and essays — over 350 pages! — the majority celebrating Mary de Rachewiltz, whose 85th birthday we mark with a special section. This section (edited by Richard Sieburth) features several facsimiles that will be of keen interest to readers of Ezra Pound. In the coming days we will be posting brief excerpts. Cover of January 1939 issue of Reijokai (Young Ladies’ World), a Japanese girl’s magazine. A Japanese translation of “Gais: The Beauties of the Tirol,” written in 1937 by then-twelve-year-old Mary de Rachewiltz, was published in this issue. Longtime readers of Paideuma will need no introduction to Mary de Rachewiltz. Ezra Pound’s daughter and translator, and a fine poet in her own right, she is the author of an extraordinary memoir, Ezra Pound, Father and Teacher: Discretions, and a longtime supporter of Pound scholarship, first at Yale (home of the Ezra Pound Papers), now at Brunnenburg Castle, Italy, where she founded The Ezra Pound Center for Literature. In addition to the documentary material in our birthday tribute, Paideuma 37 features essays on Ezra Pound, Lorine Niedecker, and Marxist poetics. More on these soon! For the full contents, see our entry for the volume on the Paideuma blog, which includes tables of contents for the entire run of the journal (link).